Updated October, 2018. Originally published November, 2016. 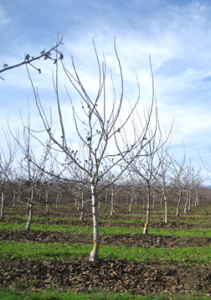 Training young walnut trees occurs in the first 1-6 years in the life of an orchard. Traditionally it has been done using a modified central leader with a minimum pruning style; the basics behind this pruning style are similar for standard spaced or hedgerow orchards. We believed for decades that if lateral bearing walnuts (most of our varieties) were not pruned, their growth would stall out from early cropping. Research conducted since 2004 investigating pruning versus non-pruning (no heading, low branch removal) on young walnut tree growth and productivity has challenged that paradigm. 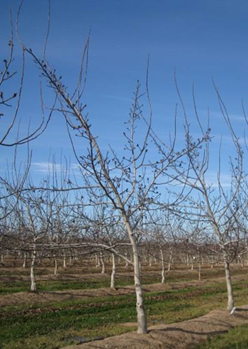 Results from trials on Howard, Chandler, Tulare, Forde, Solano and Livermore have shown that young walnuts do not need to be pruned in order to keep them growing or to produce adequate yields. In general, unpruned/unheaded trees have produced higher early yields and equivalent yields in year 4 and afterwards compared to minimally pruned trees. We also compared unpruned/unheaded and minimally pruned trees to heavily pruned trees. Heavily pruned walnut trees resulted in smaller trees with lower early yields, and is not recommended. With more knowledge comes more complexity. 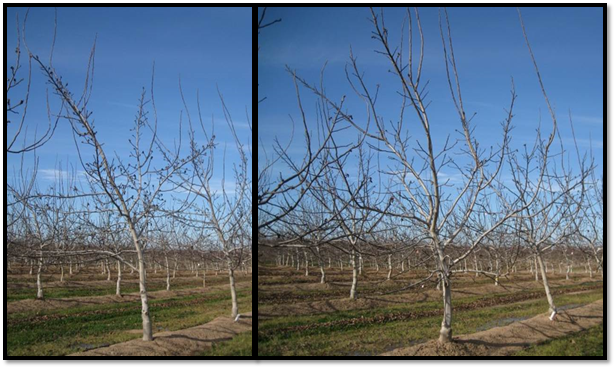 Growers now have the option when trees are one year old (first dormant pruning) or two years old (second dormant pruning) to stick with the modified central leader and train using minimum pruning, or to not prune (i.e. not head), which saves on labor and brush disposal costs. 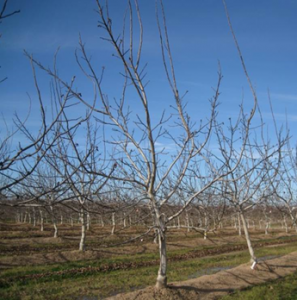 Growers interested in trying the unpruned method may want to start small and compare to the minimal pruning method to make sure it fits their management system. Keep in mind, if you start with minimum pruning, changing from pruning to no pruning in the third year may lead to limb breakage. 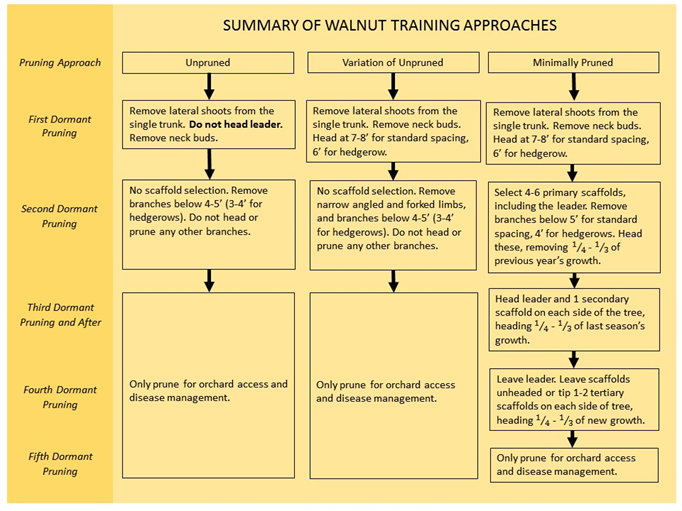 Below are the main steps comparing training walnuts for years 1-4 using the unpruned/unheaded method and variations of this method to modified central leader with the minimum pruning method. 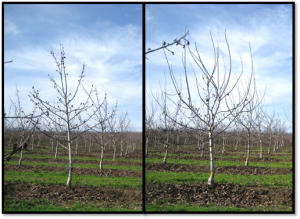 The assumption is a standard-spaced orchard, with differences noted for hedgerow systems. Young walnut trees are sensitive to freezing temperatures which can kill or damage wood so it is best to delay pruning until March or late February at the earliest. Note that unpruned/unheaded walnuts tend to put on limb extension growth in alternate years. 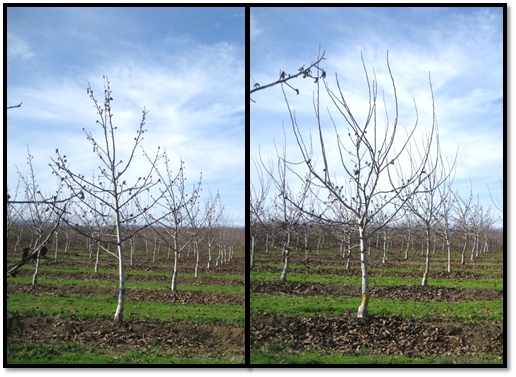 Individual shoots follow a pattern of extension growth (primary scaffold development during second growing season), followed by lateral branching (side branching with 5-8 inches growth occurring on primary scaffold during the third growing season (Photo 1), followed by another year of extension growth during the fourth growing season (Photo 2). On better soils, extension growth on scaffolds often occurs by mid-summer during the third growing season on unpruned/unheaded trees. 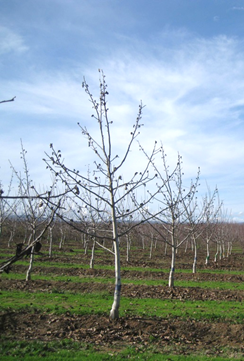 An option that has been successful in research trials and in grower’s orchards is a variation of the unpruned method. The trunk is headed at the first dormant pruning as in minimum pruning (see below), but in subsequent years, scaffold limbs (primary, secondary, etc.) are left unheaded. Some thinning of forked limbs or double leaders may be done at the second dormant pruning. This method has been used primarily in Chandler and may not be suitable for very vigorous varieties like Solano.